Every kitchen needs the basics! 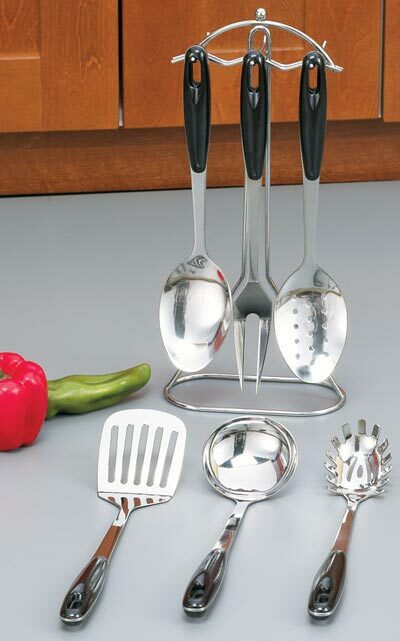 This useful Chefmaster 7-Piece Stainless Steel Kitchen Utensils Set contains multipurpose utensils to handle a number of food preparation jobs. Stainless steel Noted for its strength and resistance to rust, stains, and absorbing food flavors. Easy grip handles Help with firmly holding utensil while stirring foods. Handle hang up slots Provide easy storing within reach of mixing center or range. Storage rack Assures utensils are close by on counter top.